If you’ve been thinking about getting engaged, take advantage of these rings all under $1,500 that will get you one step closer to the alter. This entry was posted in Diamond rings, Engagement rings, Gold engagement rings, White gold engagement ring and tagged classic elegance, cut diamonds, diamond engagement ring, diamond halo, diamond ring, engagement ring, engagement ring setting, perfect combination, princess cut diamond, princess cut diamond engagement, princess cut diamond engagement ring, prong set diamond, proposal day on March 20, 2013 by admin. Diamonds come in all shapes and sizes and if you’re shopping for an engagement ring, you’ll be spoiled for choice. One thing’s for sure though – classic solitaire engagement rings are still one of the most popular design choices and if you’re looking for some tips on choosing the perfect one, I hope you’ll find the following information useful. Brilliant Cut Diamond (round shape) Of all the images you have in your mind of the perfect diamond, this is possibly the one that springs to mind before all the others. A Brilliant diamond is a round shaped diamond, cut in such a way as to produce a stone with such amazing sparkle and clarity that it truly lives up to its name. You will often see these stones set in clusters, on a band or as a single diamond in a solitaire engagement ring. Emerald Cut Diamond (rectangle with cut corners) The Emerald cut is an ideal shape if you’re looking for something a little more understated. Usually rectangular in shape and cut at the corners, this flat cut, although beautiful, does not reflect the light as much as some of the other more faceted diamonds. 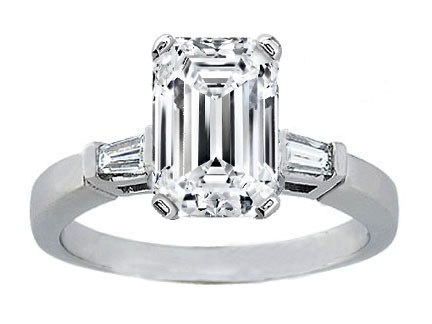 You will often see an Emerald cut diamond with other stones set alongside it, although it certainly can be set as a solitaire should this be the diamond of your choice. Pear Shaped Diamonds (pear or teardrop) The Pear shape is another Brilliant cut diamond type. A popular choice for engagement rings, a diamond of this shape also lends itself perfectly to necklaces and earrings as it hangs so beautifully. This is a wonderful choice for anyone looking for all the sparkle of a traditional round cut diamond, but in a more unique design. Princess Cut Diamond (square shape) Traditionally a perfect square, this contemporary design is the perfect choice if you’re looking for something a little different. Often set as a solitaire stone, the Princess cut reflects the light to absolute perfection which appears to make it shine even more brilliantly than other diamonds. The Princess cut is the preferred choice of many. Oval Cut Diamond (oval shape) With similar characteristics to those of the Brilliant diamond, the Oval may be the one for you if you want all the sparkle of the Brilliant style, but you don’t want a round stone. An Oval diamond offers something which is a little different, with an element of traditionalism at the same time. Yet another beautiful choice for a solitaire engagement ring. Heart Cut Diamonds (heart shape) Probably the greatest and most recognized symbol of love, the heart-shaped diamond is far less common, but still very sought after for items of jewelery to be given as romantic gifts, or for the ultimate in romance, the solitaire engagement ring. It takes a very skilled diamond cutter to fashion a heart-shaped diamond with a high-grade cut, but when done properly, the results are truly amazing. If you’re looking for a break with tradition and for a stone that’s a little different, a little more fancy, yet no less beautiful than the others, this could be the one for you. Marquise Cut Diamond (pointed oval shape) A true classic, the Marquise cut is best described as an elongated oval with pointed ends and this beautiful diamond has enjoyed huge popularity over the centuries in all types of jewelery. It is thought that the origin of the Marquise diamond can be attributed to King Louis XV of France who was so smitten with his mistress, the Marquise de Pompadour, that he ordered a diamond to be specially cut to capture the beautiful shape of her smiling lips. Hence, the Marquise diamond was created and its romantic history alone could quite possibly be the reason why so many people have chosen this exquisite gem as the stone for their own solitaire engagement ring. Solitaire engagement rings are true expressions of love – good luck in your search for the right one for you. This entry was posted in Engagement rings, White gold engagement ring and tagged brilliant cut diamond, brilliant diamond, contemporary design, design choices, diamond square, diamond type, emerald cut diamond, pear shape, pear shaped diamonds, princess cut diamond, solitaire engagement ring, solitaire engagement rings, square shape, unique design on October 23, 2011 by erika.